Understanding your Health Insurance coverage can be difficult. This is especially true if you do not know the verbiage or meaning of the terms and acronyms. Here is a list of some of the more common terms used in the insurance industry along with a brief explanation. Premium: A set amount the insured individual pays in order to have coverage. This amount is due regardless of whether services were utilized. While it is typically paid monthly, a premium can sometimes be paid quarterly, semi-annually, or annually. Deductible: A set amount the insured individual is responsible to pay before the insurance company begins paying claims. 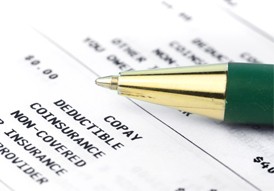 Co-pay: A predetermined, fixed amount the insured individual is responsible for paying for a specified office visit, procedure, or prescription medication. Co-pay amounts typically vary between a primary-care-physician versus a specialist office visit, as well as an in-patient versus out-patient procedure. Co-insurance: A predetermined, fixed percentage the insured individual is responsible for paying for a specified office visit, procedure, or prescription medication. Co-insurance amounts are outlined in your policy and often vary between use of in-network and out-of-network caregivers. Maximum Out of Pocket (MOOP): The total amount of money the insured individual will be responsible for paying in a set time period, typically 1 year’s time. The MOOP is a combined total of any co-pays, co-insurance, or other expenses incurred by the insured, excluding premiums. Once this threshold has been met, the insurance company is responsible for 100% of the remaining charges incurred within the policy network. Network: A list of providers that the insurance company has agreed to conduct business with which includes in-network (covered) and out-of-network (typically not covered or covered at a lower rate). Formulary: An established list of medications that the insurance company has contracted to cover. This list typically changes annually but can change throughout the year if the company provides written notice to its consumers.